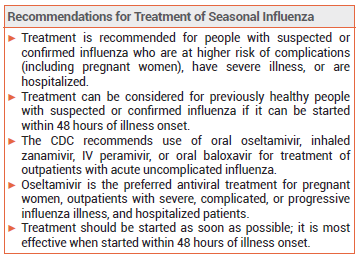 Antiviral Drugs for Treatment and Prophylaxis of Seasonal Influenza | The Medical Letter, Inc.
ANTIVIRAL DRUGS — The neuraminidase inhibitors oseltamivir (Tamiflu, and generics), which is taken orally, and zanamivir (Relenza), which is inhaled, are FDA-approved for prophylaxis and treatment of acute uncomplicated influenza. The IV neuraminidase inhibitor peramivir (Rapivab) and the oral polymerase acidic (PA) endonuclease inhibitor baloxavir marboxil (Xofluza) are FDA-approved only for treatment of acute uncomplicated influenza.1,2 The neuraminidase inhibitors and baloxavir are active against both influenza A and B viruses. In previously healthy people with suspected or confirmed influenza who are not at high risk for complications, antiviral treatment can be considered if it can be started within 48 hours of illness onset. Prophylaxis – When indicated, prophylaxis with oseltamivir or zanamivir should be started within 48 hours after exposure to the influenza virus and continued for 7 days after the last known exposure. 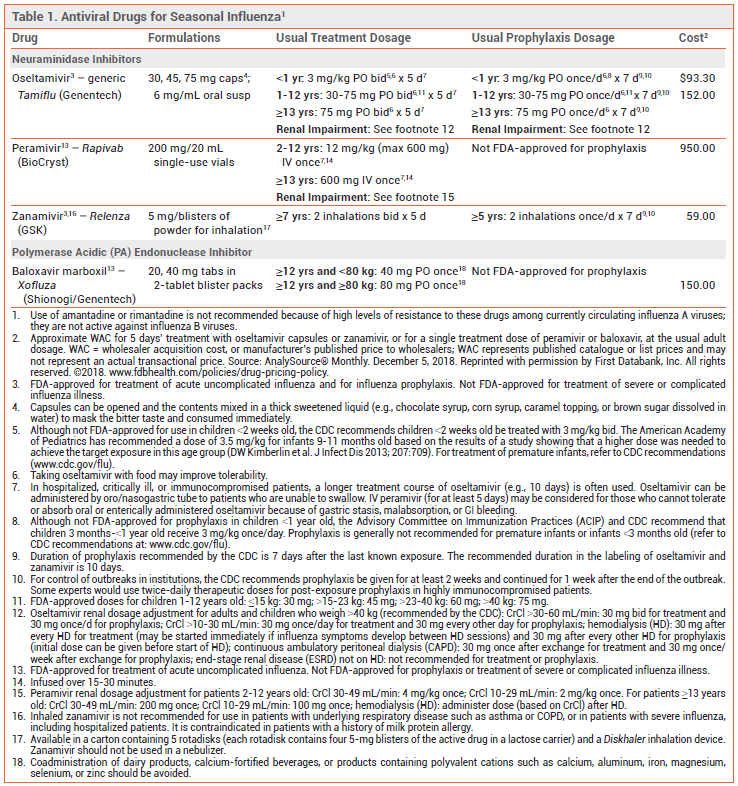 Longer durations of prophylaxis are often recommended for institutional and community outbreaks (see Table 1). Antiviral prophylaxis can be considered for pregnant women who have had close contact with someone likely to have been infected with influenza. Zanamivir may be preferred for prophylaxis because of its limited systemic absorption, but oseltamivir is a reasonable alternative, especially for women at increased risk for respiratory problems. LACTATION — Oseltamivir, which is poorly excreted in breast milk, is preferred for treatment of women who are breastfeeding. Baloxavir is active against neuraminidase inhibitor-resistant strains of influenza, including A(H1N1), A(H5N1), A(H3N2), and B viruses. Amino acid substitutions associated with reduced susceptibility to baloxavir have occurred following treatment with a single dose (in 9.7% of patients in one trial).13 Oseltamivir may be active against influenza strains with reduced susceptibility to baloxavir. ADVERSE EFFECTS — Nausea, vomiting, and headache are the most common adverse effects of oseltamivir; taking the drug with food may minimize GI adverse effects. Diarrhea, nausea, sinusitis, fever, and arthralgia have been reported with zanamivir. Inhalation of zanamivir can cause bronchospasm; the drug should not be used in patients with underlying airway disease. Diarrhea and neutropenia have occurred with peramivir. DRUG INTERACTIONS — Use of a neuraminidase inhibitor or baloxavir within 48 hours before or <2 weeks after administration of the intranasal live-attenuated influenza vaccine (FluMist Quadrivalent) could inhibit replication of the vaccine virus, reducing the vaccine's efficacy. Coadministration of antacids, laxatives, multivitamins, or other products containing polyvalent cations such as calcium, aluminum, iron, magnesium, selenium, or zinc can reduce serum concentrations of baloxavir and should be avoided.